If you a picture-addict like me then you surely like to do all sorts of things with them. You may even look for the best draw on picture apps for Android to have a little fun with them. You probably want an app to draw a mustache or a beard on something to get a good laugh. 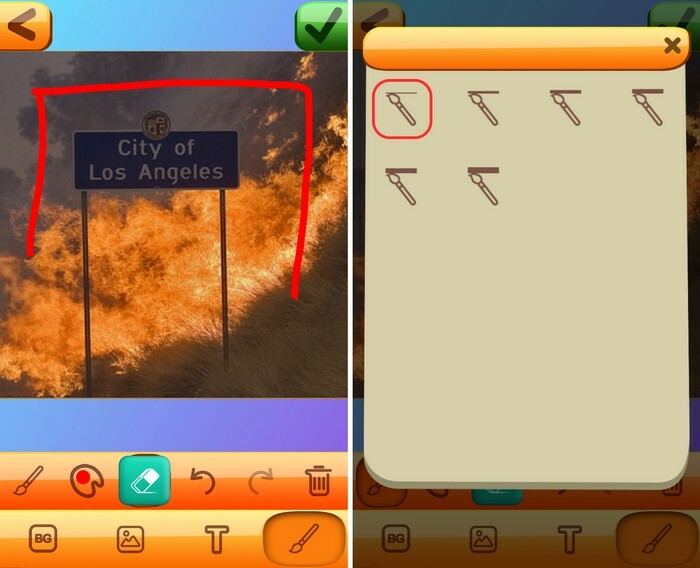 Or simply, you want to annotate something to help your non-techy friend – the draw on picture apps always come in handy to draw on pictures quickly. But which are the best draw on picture apps? If you are looking for best apps to draw on pictures, thankfully I have got you covered. The following draw on picture apps for any Android device allow you to do all sorts of things to your pictures; besides draw on them. You can add stickers and share them with family and friends. You’ll surely have fun with these draw on picture apps that let you draw on pictures all you want. Android has always lacked an important feature – image markup tool. 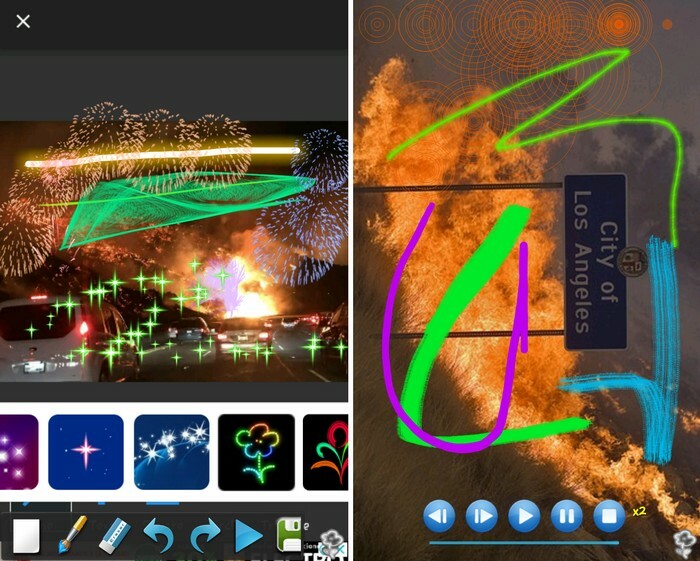 So if you need to markup something, or draw anything on the picture – you need an app to draw on pictures. Although with the introduction of Android P, we witnessed the functionality to markup image using image markup tool, yet it’s limited to screenshots only. I do expect that the “screenshot markup tool” will continue to get better as it’s still in beta. And soon, we might find this tool able to draw on pictures and remove any draw on picture apps from your phone. However, for now, it’s only a wish! And it’s better to choose a good draw on picture app for Android, so that you may quickly draw on pictures. Sketch – Draw and Paint is Sony’s official sketch app to draw on pictures and modify your pictures. Once you select your image, you’re going to see a pencil icon at the top left-hand corner. It will offer you various pens and pencils you can choose from. You can use the slider after selecting a drawing pen to decide the thickness of your drawing. You can use traditional pens and pencils, but there is also an option for fancy pens as well. Also, you can quickly create caligraphy type text on any photo you use. There is also an option to choose the color you want, and there are quite a few to choose from. You can also add all sorts of stickers as well. Not that many are available right away, but you can get lots more by going to the app’s settings on the sticker pack. The draw on picture app also lets you place another photo right on top of the one you’re already drawing on as well. You can make it as big or small as you want by zooming in and out. Also Read: How to Screenshot on Snapchat without Them Knowing? Another draw on picture app that allows you to draw on any photo you upload is You Doodle – draw on Photos. You can import images from various sources such as your phone’s gallery, Google Photos, and any others you have on your Android device. The app to draw on the picture will display the tools you need to crop, rotate, and flip your photo. You will have to deal with some ads from the very beginning, but it’s not too annoying. The app offers your essential drawing tools such as pens and pencils, but it also has some other goodies to offer. For example, you can use a paintbrush, spray, and if you want to use a color you see in the image, just use the eyedropper to copy the color. Not only can you draw on your picture but you can also add things such as stickers, frames, text, filters, crop, record and resize it as well. What I liked most about You Doodle – Draw on Picture app is that it has got some professional image editing tools like smudge tool, blur, clone, recolor, spray paint, brush, etc. You may also adjust the tool strength to increase or size, opacity, and more. If you are looking for a simple but powerful draw on picture app to draw on your pictures, You Doodle – Draw on Picture app for Android is for you. PicsArt Photo Studio is not something which is a new picture editor app. It has existed for years and has already gained popularity. It is a collage maker and pic editor app with so many options to edit your pictures; you won’t know where to start. When you first launch the picture drawing app, tap on the pink circle with the white plus sign. 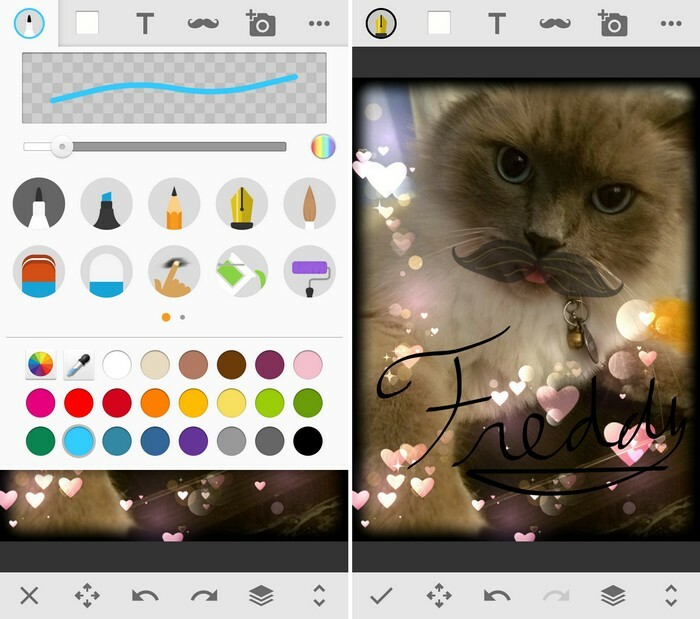 Tap on the Draw option to doodle on your images. First, you’ll need to choose a background for your creation, and at the top, you can also select the format. You might want to either pick the Facebook format, 1:1, 4:3, 3.2, and more! The pencil icon will be automatically chosen, and it will be highlighted in grey. If you’re not happy with the selection, tap on it and determine the size and the opacity of the doodle. The app presents you with tools to edit your pictures, create photo collage, and click pictures in camera mode with applied presets and filters. But what might be the most useful tool for drawing on pictures is the draw tool. 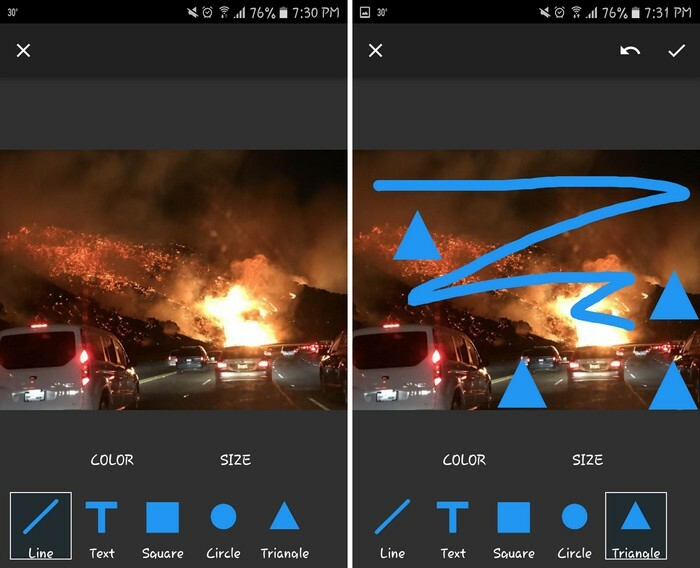 With the draw tool, you can mark up something by drawing with pencil, erase anything you don’t want on the picture, or add texts for annotation. The draw tool is intelligent and provides you with pre-made shapes and tools available. The app also allows you to modify the transparency of the font color, pick the color, undo drawings, add filters, and you can even write on the images using the keyboard. If you love what you’ve created, there’s also an option to share it on social networks such as Facebook, Instagram, or Twitter. As the name says it all, Draw on Pictures app allows you to draw on pictures quickly. This also likes to keep things simple. It’s an app that only offers the essentials for its users but with a useful feature. It lets you add pre-installed images, so you don’t have to draw them yourself. 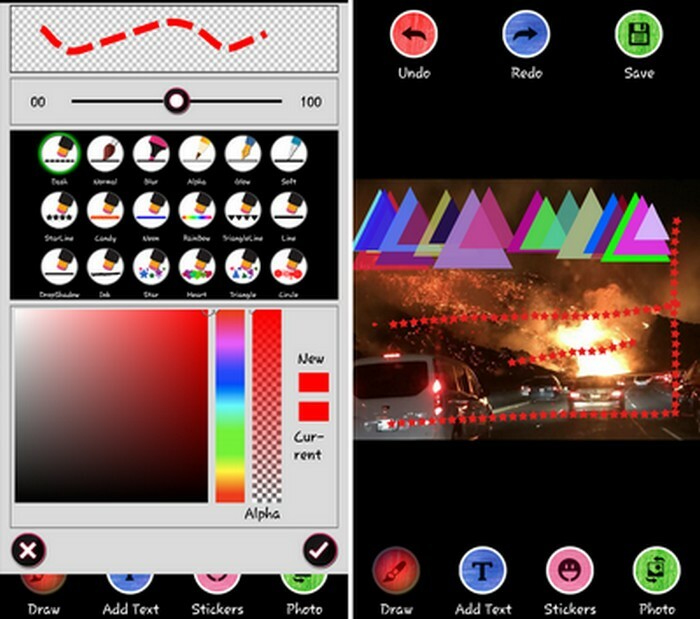 Tap on the color option and the drawing or shape can be in various colors. You can add shapes such as squares, circles, triangles, and you can also add text if you want. The Line option lets you go freestyle so you can draw on picture whatever you want. Once you’re done with your creation, you can tap on the share button and share it with whatever app you have installed on your phone. It’s a great app to draw on pictures if you’re not very tech-savvy. What I like most about the Draw on Pictures app for Android is that unlike other picture drawing app with come with in-app purchases, this app is completely free. Kids Doodle – Color and Draw is a picture drawing app that is directed towards the little ones. Usually, kids love to draw, even if it is on pictures. The draw on picture app for kids features 18 brushes such as rainbow, glow, spray, crayon, ribbon and more. There is even a fireworks option. Every time you tap the display, a different kind of firework appears and of a different color. When you tap on the paintbrush option, you’ll get a preview of what type of doodle you can make. If you make a mistake, you can always count on the eraser option to undo any errors. There is also a play option that will draw whatever it is you illustrated, and in the order, it was done. It’s like a movie of your creation, and there is even a pause button so you can stop it at any time. If you have a kid whom you want to teach how to draw on pictures, this picture drawing app is a good choice. The kids can learn to draw on pictures easily using this draw on photo app. Draw on Pictures by Dexati is a feature-rich draw on photo app for Android. 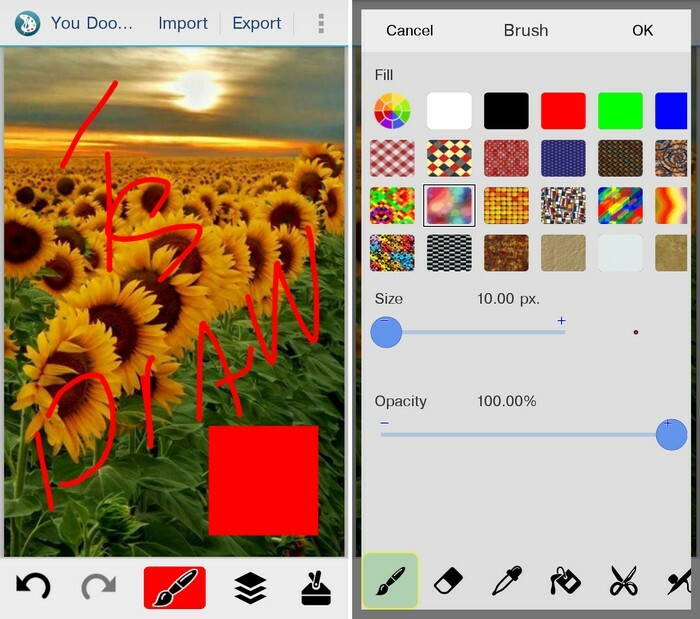 If you always like to have as many options as possible, then you’re definitely going to love this picture drawing app. As soon as you open it, you can choose from an extensive variety of options. For example, you can choose to draw on photo, draw on blank, add tattoos, draw on nature, add emojis and see your creations. You will have to deal with a few ads here and there, but it’s nothing annoying like other apps to draw on pictures. 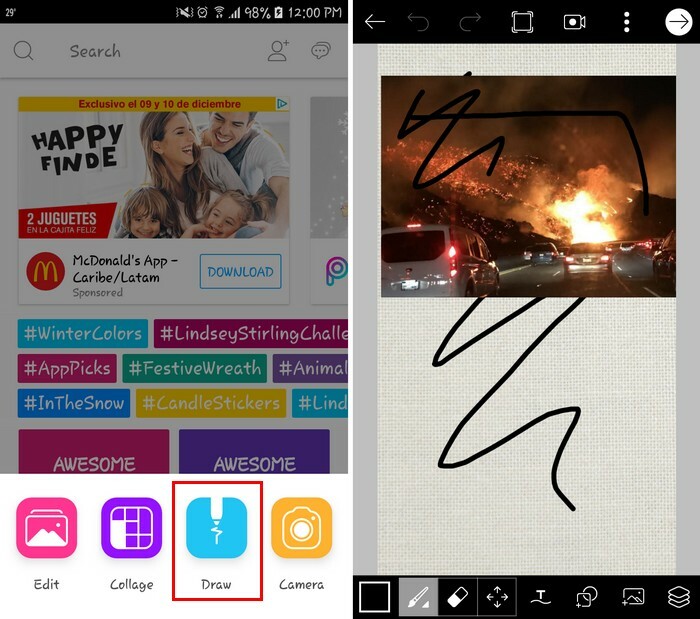 Once you’ve chosen what picture you want to draw on tap on the draw option at the bottom left. The app will offer you a large variety of pens you can use to draw on your images. For example, you can draw an uninterrupted line, line of stars, dots, dash, and all sorts of shapes too. The shapes won’t let you choose what color you can draw them in, but you can choose the color when you’re not using shapes. When it comes to the colors to draw in, you’ll have so many options that you won’t know where to start. You can choose from various shades of the color you want to use. Once you’ve decided on a color, don’t forget to tap on the check mark or else you’ll have to start all over. You can also add text to your image and redo/undo any changes you’ve made to it too. There’s even an option to change the image, just in case you’ve changed your mind. This draw on photo app offers many options and functionality for customizing your picture output while drawing on pictures. Although a picture can explain what thousands of words can’t, yet pictures on their own can sometimes be boring and need a little something extra. With the above-mentioned draw on photo apps, you’ll be able to add all sorts of drawings and shapes to your images whenever you want. What’s even better is that all the draw on picture apps are free, so if you’re not happy with one, all you have to do is uninstall. These picture drawing apps are even great options for the kids and why not, even the adults in the family. Which one are you going to try first? Leave a comment and let me know.